Red Robin launched a new limited time burger called "Red Ramen Burger" on April 2, 2016. The branch we went to in Secaucus, New Jersey, had a poster on the door and I knew they'd sure have it. The menu they handed us had an insert introducing the Red Ramen Burger, too. It's described as "served on a crispy seasoned ramen bun, it comes topped with Teriyaki and Chiu Chow aioli, fried jalapeño coins, a medley of chili-infused shredded cabbage, carrot and onion and garnished with fresh basil." I hate mayonnaise and I asked the aioli sauce on the side, and medium for the patty. When I searched "Chiu Chow," some showed it's a part of China called Chaozhou, but I don't know exactly what it is in this case. When it's served, I was quite disappointed to see the deformed Red Ramen Burger with drooping down fries. The shredded vegetables were flying around and fried jalapeño coins were not even between the burger. This is the Chiu Chow aioli. First it had toasty flavor like peanuts with a bit of spiciness, but the latter half was just MAYONNAISE, thus, I only tried a bit and never used it for the burger. I placed the upper ramen noodle bun to make it look nicer, but still, it's so different from the advertising image with sort of poor quality and much less amount of vegetables. 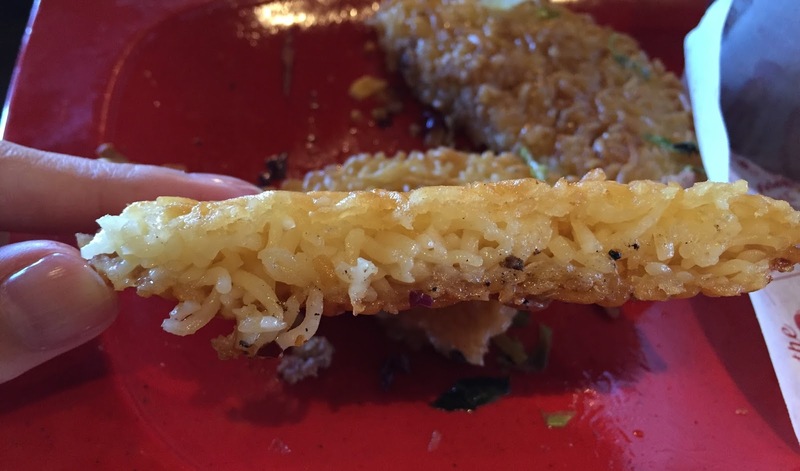 The bun was truly made with fried ramen noodles. 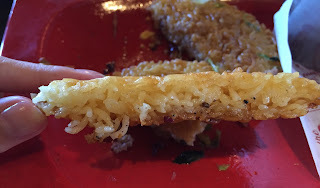 When I cut it with a knife, the surface of the ramen noodle bun was crunchy and the inside was a bit chewy. The patty was cooked closer to well-done than medium. The ramen bun had a great texture, charred beef patty was fragrant and juicy, and the vegetables were refreshing. Fried jalapeños were a bit soggy and not crispy, but they're adding nice heat. 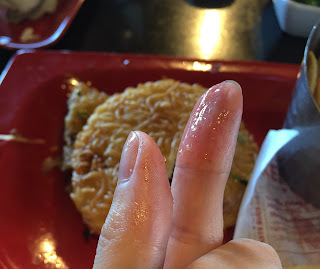 I liked the texture of the lightly salted ramen bun, but it's very oily and my finger were covered in grease. I was quite afraid of getting sick afterwards and only ate a quarter of the ramen bun. Usually I enjoyed their fries but this time, they're sadly soft and missing crispiness.